From Rudolph to Frosty, no production company has done more to flood the airwaves with Christmas specials than Rankin/Bass Productions. Founded by Arthur Rankin, Jr. and Jules Bass, Rankin/Bass created dozens of cartoons from the early 1960s through the 1980s, from ThunderCats to the animated version of J.R.R Tolkien’s The Hobbit. Yet the company is most famous for its holiday specials—often based on popular songs and existing properties—and its innovative use of “Animagic,” which combines stop-motion animation with puppets to create a unique visual style. While there are Rankin/Bass entries for Easter and Thanksgiving, too, the company earned its reputation with a series of 19 Christmas specials—18 of which were created between 1964 and 1985—that dazzled and occasionally horrified small children. It can be difficult to know where to get one’s Yuletide on with such a massive catalogue. Thankfully, Paste is here to shepherd you through the world of Rankin/Bass, from worst to best. If you watch the original Rudolph and think to yourself, “This is fun and all, but I really wish they found a way to work in a caveman, a camel-clock hybrid and Benjamin Franklin,” then this is the Christmas special for you. Easily the weirdest of the Rankin/Bass specials, Rudolph’s Shiny New Year is a mess: Taking place immediately after the first Rudolph, it features a time-traveling quest in which our favorite red-nosed reindeer travels across time periods (technically, time islands) to find Happy, the big-eared New Year’s baby that’s gone missing. There’s a bunch of exposition to explain the increasingly murky concept of time in the Rudolph-verse, but basically Happy has to be found before New Year’s Day or else the current year will go on forever. Rudolph collects a number of forgettable side characters on his adventure, including the aforementioned caveman and American founding father, while also being pursued by a villainous vulture who for arbitrary reasons will die if the New Year begins. On paper, the special sounds like a fun trip, but it’s a laborious viewing experience. The weird factor can only do so much to cover up the weak story, songs and supporting characters. Bizarre Factor: 10. None of this makes any sense no matter how hard they try to explain it. After the smashing success of Rudolph, Rankin/Bass took three years to produce a follow-up. What they came up with was Cricket on the Hearth, an hour-long special that swapped out the now-iconic Animagic for unappealing traditional animation. It also removed any really engaging songs or fun characters. Loosely based on a Charles Dickens Christmas story of the same name, the special follows a poor toymaker who must take care of his daughter after she goes blind due to the overwhelming news that her fiancé has been lost at sea. The toymaker’s miser of a boss takes an interest in the daughter, as does the old man with a bad wig and the same blue eyes as the fiancé who randomly shows up just before Christmas. With poor, blocky animation and forgettable songs; there’s a reason this special hasn’t caught on like the rest of Rankin/Bass’ earlier output. At nearly 50 minutes, it’s a drag for those without nostalgic feelings for it. The only truly memorable moment is the hard left-turn it takes halfway through its runtime. It involves the kidnapping of the cricket narrator, an animal-only cabaret show and perhaps the most surprising (yet casual!) murder scene ever depicted in a cartoon Christmas special. Bizarre Factor: 5. Mainly for the bizarre cricket subplot that takes up the middle portion of special. The Little Drummer Boy, Book 2 answer all your unresolved questions from the first Little Drummer Boy. With a name only slightly less clumsy than 2 Little 2 Drummer Boy, this special takes place immediately after the end of the first Little Drummer Boy and continues the saga of the aforementioned drummer boy, Aaron. No longer angry with the world, Aaron goes with one the three wise men to visit a bell maker who is making special silver bells to ring in honor of the birth of Jesus. But Roman soldiers, go-to villains in a lot of these specials, arrive first and steal the silver bells. It’s up to Aaron to recover the bells, which he does in about three minutes and without much difficulty. Even at 22 minutes, this special labors to fill its run time, as summed up the nearly four-minute middle section that revolves around one song about the glory of using currency for trade. The song is pure filler, but “Money, Money, Money” is one of the catchiest songs in any of the Rankin/Bass specials. Unfortunately, the rest of the special never matches the thrill or emotional weight of the song or the original special. More of a Groundhog Day special than a Christmas special, Jack Frost sits comfortably in the ‘meh’ category. It stars the embodiment of winter himself, Jack Frost, who’s become lonely due to his inability to interact with the society he brings winter to every year. After falling in love with a beautiful woman, Frost is allowed to become a human for one winter to woo her and complete a series of tasks to remain a human. But he has competition from the gorgeous knight in gold armor and from Kubla Kraus, the despot leader of the village. Since every other character is a forgettable bore, let’s focus on Kraus, who owns the special whenever he’s on screen. A weird hybrid of Burgermeister from Santa Claus is Comin’ To Town (both are voiced by Rankin/Bass regular Paul Frees) and Dr. Eggman from the Sonic series, Klaus has built an army of tin robots—as well as a tin forest, tin horses and a tin ventriloquist dummy named, err, Dummy, who Kraus has delightfully weird conversations with throughout the special. There’s nothing inherently bad about the special, and it does have a number of entertaining songs, but one could probably find more entertainment in reading its Amazon reviews, in which it’s often confused with the atrocious 1998 Michael Keaton movie of the same name. After 15 Christmas specials in 16 years, it seems Rankin/Bass started to run out of Christmas songs or stories that could feasibly be turned into a special. So, naturally, the company took one of the most iconic figures in children’s literature and forced a Christmas theme onto him, creating a weird and clumsy feature known as Pinocchio’s Christmas. A prequel to the original Pinocchio story, the special follows our wooden protagonist through a series of misadventures as he tries to learn what gift to give his father, Geppetto, for Christmas. Since this is Pinocchio, the source of his misadventures are twofold: He’s a jerk to everyone, going so far as to smack Dr. Cricket (Jiminy, for those more familiar with the Disney version) with a book, and he’s also shockingly naive when it comes to stranger danger. Marionette kidnapping, mistaken death and the introduction of a love interest never mentioned in the original ensue. There’s quality Animagic in the special, three good songs, and the lack of narrator is a welcome change of pace. But your enjoyment is going to depend on how much you can stand Pinocchio himself. It works best if you imagine Pinocchio as an endearing scamp, not a burgeoning sociopath. Latter-era Rankin/Bass specials really push the definition of “Christmas special,” and aside from Rudolph’s Shiny New Year, no special does that more than The Leprechaun’s Christmas Gold. The second-to-last Christmas special made during the golden era of Rankin/Bass, it’s a particularly odd tale of an Irish cabin boy who accidentally releases a banshee who was trapped inside of a pine tree (hold on, it gets weirder). The boy meets an elderly leprechaun, who tells him that the banshee will torment the leprechauns on the island in hopes of getting their gold. If she doesn’t get gold by dawn of Christmas morning, she will turn into salty teardrops. The special understands that none of this makes sense, so half of its 25 minutes are give over to the leprechaun narrator explaining the lore behind the gold, the banshees and his own estrangement from his family (all of it thankfully wrapped up in the final three minutes). The movie is so overwhelmingly Irish, you half expect the leprechaun to be named Mickey McPotato O’Guinness. On the bright side, the Celtic folks songs are catchy and stand out favorably compared to some of the sameness that hurts the other specials’ songs. Bizarre Factor: 8. The banshee turning into tears seals it. Before there was the Marvel Cinematic Universe, there was the Rankin/Bass Christmas universe. 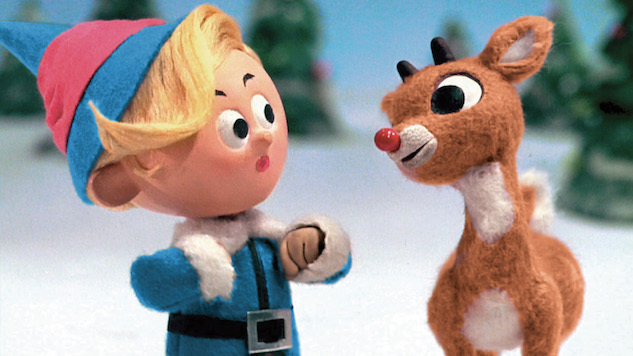 Starring Rudolph, Frosty, and Santa Claus—with a late cameo by Jack Frost—this full-length special perfectly embodies all the pros and cons of Rankin/Bass. Along with the aforementioned Christmas favorites, Christmas in July introduces a handful of one-off characters, from welcome additions (the main villain, Winterbolt, and the cowboy circus owner, Lilly Loraine) to utterly forgettable bores (Milton, the ice cream salesman whose troubles set the special’s plot in motion). And what a plot it is! It would take hundreds of words to do it justice, but it does involve a circus by the sea, a wizard risking war with the Starks by proclaiming himself The King of the North and the human embodiment of Aurora Borealis (at this time of year) retconning most of the plot from the original Rudolph. Overall, it’s a quirky special with some of the best Animagic Rankin/Bass ever did, but it’s a long 97 minutes. A solid 20 to 30 minutes and three or four songs could be cut and nothing of real value would be lost. If you’re willing to make the time for it, it’s worth the view. Bizarre Factor: 8. Snow snakes, Aurora Borealis and a floating circus make this one of most bizarre in the collection. Nester is essentially the re-telling of Rudolph, except it’s set in Biblical times and all the music is straight out of Nashville. Instead of a shiny nose, it’s long ears that lead to Nester being mocked by his fellow animals. Long story short, Nester is thrown out of his home, and his mother dies protecting him from a snowstorm. A cherub befriends Nester and leads him to the outskirts of Bethlehem, where he’s once again tormented about the length of his ears—that is, until Mary and Joseph buy him. It’s here that Nester needs to prove his worth, as a sandstorm stands between them and the baby Jesus being born in that manger. As a whole, Nester is a well-intentioned (if lesser) version of the “misfits can make a difference” story that Rankin/Bass did much better in Rudolph. The story is thin and sometime struggles to fill the brief 22-minute running time. Thankfully, the special is lifted by country singer Roger Miller, who narrates and sings the special’s three songs. His warm, folksy narration and singing style does everything it can to lift the been-there, done-that material. Santa Claus is a wonderful and caring toymaker, but he will ruin you if you get on his bad side. That’s the message learned by residents of a small New York town in ’Twas the Night Before Christmas, as Santa returns their letters after being offended by an anonymous column published in the newspaper that claims St. Nick doesn’t exist. The town is freaked out by the situation and the column, penned by a nerdy mouse who signed it ‘all of us’, and hire the clockmaker narrator and his mouse assistant to build a clock tower to appease the angry Claus and make sure he does not skip over the town. There’s a lot of weird stuff going on aside from the premise, including a central theme of “Shut up, nerd! Stop thinking and just believe.” (For instance, the mouse assistant constantly berates his son, the author of the letter, for not believing in Santa Claus.) But the traditional animation is appealing and the show-stopping tune sung by the main human character, “Even A Miracle Needs a Hand,” is arguably the best original song to appear in any Rankin/Bass special. If it sounds familiar, it’s likely from when South Park unironically used it in a montage when the boys put together an animated Christmas special. Bizarre Factor: 3. Pretty straightforward, except for the whole mice-and-humans-living-in-harmony thing.